The Christmas Eve Maine Lobster seafood dinner is an Italian-American holiday tradition that is immensely popular in New England, so much so that serving wonderful seafood dishes on Christmas Eve has been embraced by people of all heritages. The historic seven-fish dinner has given way over the years to include elaborate spreads of cold shellfish such as oysters, clams and of course shrimp. But the starring role in the Christmas Eve celebration is now reserved for fresh Maine lobsters prepared any number of ways. My neighbors always prepare several lobster courses on Christmas Eve with the favorite a pan roasted lobster flavored with Bourbon and served sizzling hot in a creamy butter sauce. Pan roasted lobster is a little tricky to prepare but with this favorite recipe the flavor is explosive and your family and guests will love it. This favorite pan roasted lobster recipe allows the potent bourbon flavor to mingle wonderfully with the sweetness of the lobster. The use of fresh chervil imparts a hint of anise flavor to the lobster as well. And pan roasting lobster gives it a surprisingly tender texture. For best results, you will need a large, heavy iron sauté pan or deep skillet, metal tongs and a large chef knife. 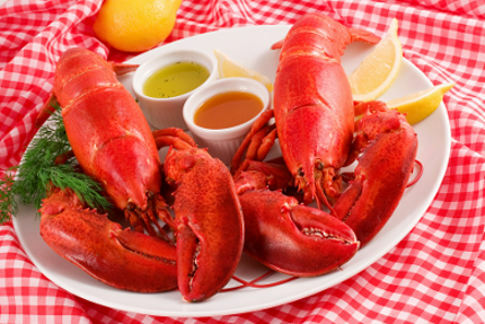 Make sure to use fresh, live hard-shell Maine lobster. Care must also be taken not to place the lobster pan too close to the heat in the oven or broiler. The Christmas Eve pan roasted lobster recipe can be served as a main course for two or as a first course for four. Preheat the broiler or oven as hot as possible (550F). Position the oven rack in the upper third of the oven. Kill the lobster by splitting them lengthwise. Remove any tomalley and roe found. Cut off the claws where the knuckle meets the carapace. Cut the lobster halves into quarters. Including the claws, you will now have 6 pieces of each lobster. Place the pieces shell side down on a plate. Place the tomalley and roe in a small bowl and use a fork to mash into small pieces. Place the 12-inch pan over the highest stove surface heat possible. Allow the pan to heat for 3 to 5 minutes. Add the peanut oil and heat until it forms a film on the pan. Slide the lobster pieces, shell side down, into the hot oil. Using tongs, move the pieces to sear the shells evenly. Hold the lobster pieces m with the tongs and press the shells into the hot oil to sear. The claws need to be seared on only one side. When the shells have all turned bright red, which should take no more than 2 minutes, turn the pieces over. The oil will also be beautifully red tinged. Add the tomalley and roe to the pan. Place the pan in the oven. If using the broiler, cook for 2 minutes. If using the oven, cook for 3 minutes. The shells should be slightly browned, even a bit charred in places. Remove the pan from the oven and return it to the stove at maximum heat. Turn off the oven and put in your serving plates in to warm. Remember, the handle of the pan will be red-hot and will stay hot until the dish is complete. To avoid burns, wear oven mitts. Add the shallots to the fat in the pan and stir. Add the bourbon and ignite. Shake the pan until the flames die down. Add the wine and let the liquid in the pan reduce. Turn the heat to low. 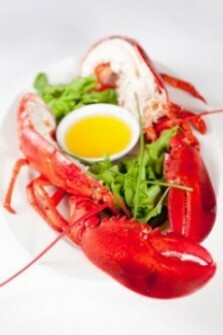 Quickly remove the pieces of lobster and place, shell side down, on warm plates. Try to “reconstruct” the lobster so that it looks similar to a split lobster. Arrange the claws so that they lean into the center of the lobster. Return the pan to the heat and add the butter, chervil and chives. Swirl or stir the butter in the pan to create a creamy sauce. Season to taste with salt and pepper. Spoon the sauce over the lobster pieces and serve at once. Note on wine pairings: Champagne and other sparkling wines pair beautifully with shellfish and lobster dishes that have butter. They work well with notes of anise, ginger and mild curry, as well as toasty flavors from breadcrumbs or nuts. Try a top of the line champagne with your pan roasted lobster.